In every segment of society, irrespective of race, class, religion, or sexual orientation, women and men grapple daily with the profound impacts of cultural conditioning around gender and sexuality. Gender relations are in a state of crisis across institutions worldwide, including academic institutions. The symptoms are there – dating abuse, homophobia, sexual exploitation, dysfunctional intimate relationships, gender-based violence, and emphasis on unrealistic socio-cultural ideals of masculinity and femininity (male toughness; female beauty). This open session will be an interactive mini-workshop which provides a ‘taste’ of the longer three-day Gender Reconciliation programme. It will be highly participatory, and will comprise experiential processes and exercises; discussions and dialogue in plenary, small groups, pairs, and debriefings. Through this course, a forum is provided in which participants can enter into an exploration of their own gender conditioning, and can challenge their assumptions about other genders. This day-long session is appropriate for people of all sexual orientations, faith traditions, race, ethnic and cultural backgrounds. It will provide a platform for participants to confront and dismantle personal and cultural patterns of gender conditioning, and together begin to address and transform gender injustice. 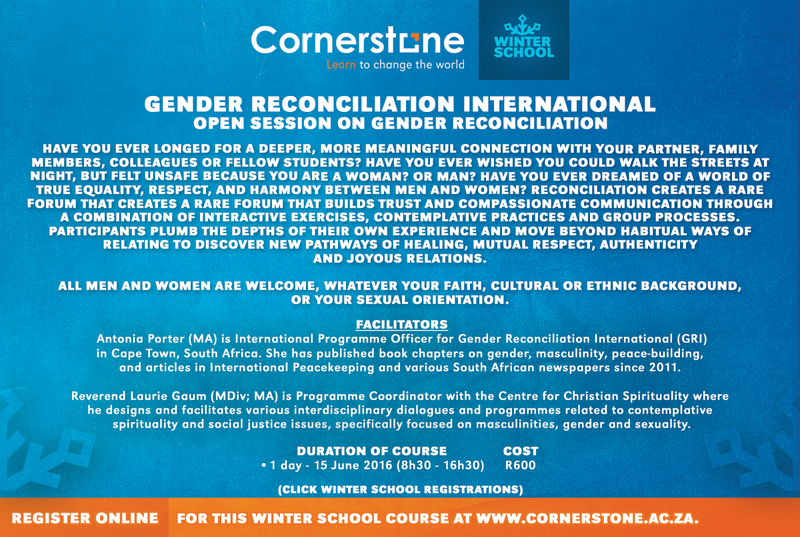 Course prerequisites: an intention of healing and safe space; and a willingness to explore, share and witness together the effects of gender inequity as part of transforming gender relations in broader society. About the Presenter: Reverend Laurie Gaum (MDiv; MA) is Programme Coordinator with the Centre for Christian Spirituality where he designs and facilitates various interdisciplinary dialogues and programmes related to contemplative spirituality and social justice issues, specifically focused on masculinities, gender and sexuality.